Variety of Toy figures from various manufacturers like Bullyland, CollectA, Papo, Safari Ltd., to collect and play with. Dinosaur toy figures of the australian brand Australian Age of Dinosaurs. The toy brand of Australian Age of Dinosaurs was brought to life in 2016. Under guidance of the museum, a line of scientific correct figures of Dinosaurs from Australia shall be produced. Dinosaur toy figures by Battat / Terra. The Dinosaur figures from the Terra by Battat were created by Dan LoRussso. The figures are in scale 1:40 and were produced for the Boston Museum of Science. Dinosaur toy figures by Bullyland. Toy figures of the germany manufacturer Bullyland. These figures are hand-painted and made of plastic. Dinosaur toy figures from the Carnegie Collection made by Safari Ltd. These Dinosaur figures are out of production since 2015. Great variety of Dinosaur toy figures from CollectA. The Dinosaur toy figures are detailed and hand-painted. Merchandise figures from the animation movie 'The Croods'. Scientific accurate designed figures of Dinosaurs and other prehistoric animals by EoFauna. The detailed figures are realistically painted. Here you find the Merchandise figures from the cartoon series 'The Flintstones'. Dinosaur toy figures from the italian manufacturer GeoWorld. Toy figures from the popular animation movie 'Ice Age'. Cute toy figures of young Dinosaurs and other prehistoric animals by Gimiki's Journey. Dinosaur toy figures by Mojö Fun. The figures are detailed shaped and hand-painted. Funny Dinosaur toy figures of various manufacturers, to collect and play. Fantastic Dinosaur toy figures by Papo. The figures are very detailed designed and lovingly hand-painted. Cuddly Dinosaur Plushies made from velvety material. The good quality of these stuffed Dinos makes them cuddly toys. Dinosaur toy figures by Recur. The material is ideal for playing, robust but flexible. 2D and 3D Dinosaur puzzles. Wide range of beautiful designed figures of Dinosaurs and prehistoric animals by Safari Ltd. The figures are nicely hand-painted. Dinosaur toy figures by various manufacturers. 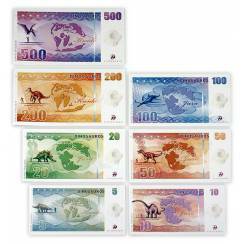 Set of 28 Dino Notes. 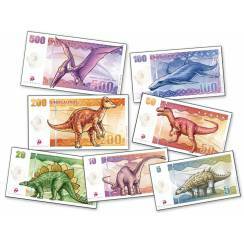 Set of 28 Dino Notes. Tullimonstrum Model in scale 1:1, 31.5 cm long. Model of a Elasmosaurus, 30 cm long. Model of a Acrocanthosaurus with prey in scale 1:56, approx. 19.5 cm long. Fantastic Model of a Tyrannosaurus rex in scale of about 1:18, 76 cm long. Model of a Scutosaurus in scale 1:10, 34,5 cm long. Model of a Embolotherium cow in scale 1:20, 20 cm long. Model of a Tyrannosaurus rex in scale 1:20, about 65.5 cm long. Dinosaur Model of a Caudipteryx in scale 1:5, 17.5 cm high. Model of a Troodon in scale approx. 1:15, 16 cm long. Model of a Deinonychus in scale 1:12, 25 cm high. Delicate Dinosaur Miniature of an Utahraptor in scale 1:72, 5,3 cm lang. Spinosaurus swimming, Dinosaur Toy Figure by Safari Ltd.
Spinosaurus Toy Figure in scale approx. 1:40, 42 cm long. Stegosaurus Figure in scale approx. 1:36, 25.5 cm long. Pteranodon crouching, Pterosaur Toy Figure by Safari Ltd.
Pteranodon Toy Figure, 12.5 cm long. New Colour Scheme: Allosaurus Toy Figure in scale 1:35, 26 cm long. Model of the prehistoric crocodile Kaprosuchus, approx. 29 cm long. 3 playing Baby Raptors in scale 1:1, by 'Crash' McCreery. Spinosaurus Toy Figure, limited Edition, in scale 1:35, 40 cm long. Model of a Tyrannosaurus rex in scale 1:35, 35,5 cm long. Baryonyx Toy Figure in scale 1:30, 35 cm long. Anchitherium Figure in scale 1:12, 9.5 cm long. Prehistoric Elephant Toy Figure in scale 1:35, approx. 24 cm long.